The World Cup, the greatest sporting event in the calendar, kicks off in Russia tomorrow night. But if a summer of football fills you with the dread of hundreds of awkward conversations about players you've never heard of applying tactics you don't understand, rest easy: Amazon has you covered. 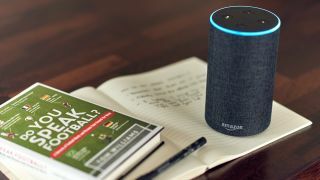 It's Alexa voice assistant, as found in its Echo speakers and smartphone apps, has been updated to help even the most football-phobic bluff their way through the tournament. You'll be able to ask Alexa trivia questions, like the year England won the World Cup, to more specific questions, like what a "false nine" is or info on Brazil's Roberto Firmino. And, if you just want a daily rundown of everything you need to blag your way through a conversation on a day-by-day basis, just ask "Alexa, how do I bluff my way through the World Cup" for the latest info you need.